Silencing Many Hospital Alarms Leads To Better Health Care : Shots - Health News Alarms are good and necessary things in hospital care — except when there are so many that caregivers miss signals of a patient in crisis. Trying to conquer "alarm fatigue," one hospital turned off the beeps — and found that patient care actually improved. Go into almost any hospital these days and you'll hear a constant stream of beeps and boops. To most people it sounds like medical Muzak. But to doctors and nurses, it's not just sonic wallpaper. Those incessant beeps contain important coded messages. "The three-burst is a crisis alarm," systems engineer James Piepenbrink of Boston Medical Center explains on a tour of 7 North, the hospital's cardiac care unit. That might signal that a patient's heart has gone into a potentially fatal arrhythmia or even stopped altogether. "Two tones is a warning," he says. That can mean something ominous — or nothing worth worrying about. Alarms are good and necessary things in hospital care, except when there are so many of them that caregivers can't keep track of the ones that signal a crisis that requires immediate attention. Then it may be that less technology can actually be more effective. In the case of Boston Medical Center, an analysis found that 7 North was experiencing 12,000 alarms ­a day, on average. That kind of cacophony was producing a growing problem known as "alarm fatigue." "Alarm fatigue is when there are so many noises on the unit that it actually desensitizes the staff," says Deborah Whalen, a clinical nurse manager at the Boston hospital. "If you have multiple, multiple alarms going off with varying frequencies, you just don't hear them." That can be dangerous. Patients can die when an important alarm is missed, or an electrode on a patient's chest comes unstuck, or a monitor's battery goes dead. Boston Medical Center hasn't recorded any patient deaths because of alarm failure, but, Whalen says, "we were lucky." A Boston Globe investigation in 2011 found more than 200 deaths nationally related to alarm problems. Last year, the Joint Commission, a national quality-control group, warned of 98 alarm-related instances of patient harm, including 80 deaths and 13 cases of permanent disability. The known alarm-related problems are just the tip of an iceberg, according to Dr. Ana McKee, the Joint Commission's chief medical officer, because such cases are seriously underreported. "It is pervasive in almost any accident that occurs in a hospital," McKee says. "If you look carefully, you will most likely find that there was an alarm as a contributing factor." That's why the Joint Commission has put alarm problems at the top of its current list of issues that hospitals are expected to tackle. McKee says technology has gotten out of control. "We have devices that beep when they are working normally," she says. "We have devices that beep when they're not working." 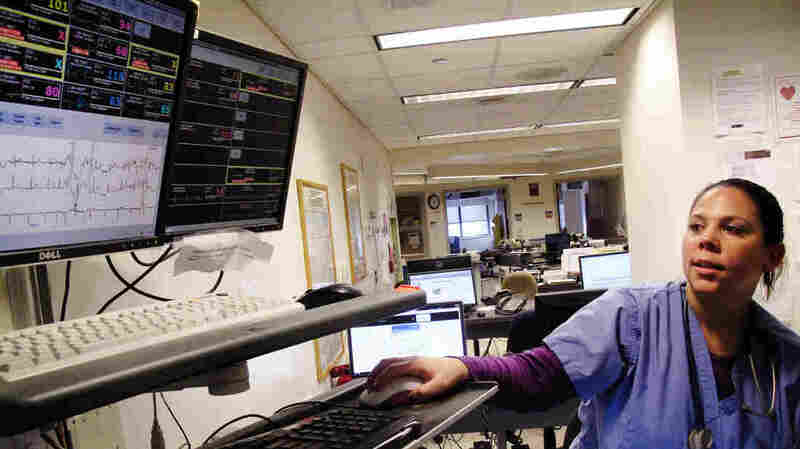 Boston Medical Center is attracting national attention as a hospital that apparently has conquered alarm fatigue. Its analysis showed the vast majority of so-called "warning" alarms, indicating potential problems with such things as low heart rate, don't need an audible signal. The hospital decided it was safe to switch them off. The hospital also upgraded some low-level "warning" alarms to a higher level, signifying "crisis" — for instance, a pause in heart rhythm. And nurses were given authority to change alarm settings to account for patients' differences. "Once that happened," nurse Deborah Whalen says, "many, many, many alarms disappeared. And instead of 90,000 alarms a week, we dropped to 10,000 alarms a week." That's on 7 North alone. The hospital's success in reducing alarm fatigue is detailed in the Journal of Cardiovascular Nursing. Whalen says it's a clear case of less is more. "I think less is better," Whalen says. "If you have more and more data, more and more alarms, more and more technology — [it's] bad data in, bad decisions made." These days you can easily hear how quiet 7 North and all of the adult medical-surgical units at Boston Medical Center have become. Instead of a steady stream of beeps, minutes can pass without an alarm. So when a "crisis" alarm sounds, the staff can easily hear and respond. "It's a lot more manageable," says staff nurse Amanda Gerety. "It's a lot more pleasant being at work." And when she sleeps, she says with a laugh, "I don't hear alarms in my dreams anymore." The hospital says patients like it better, too. For one thing, when they press the nurse-call button, the nurses are more likely to hear it.